Wow it is not very long now until Christmas although my North American friends have Thanksgiving coming up shortly. I am still working on Christmas ideas and I absolutely love the Yuletide Carol papers with the Victorian feel to the papers and they are so versatile for lots of different projects. Today I will feature three different ideas for using these gorgeous papers. First up are three cards that I have made using patterns from Make it From Your Heart Volume 2 and inspiration from the Annual Inspirations book. 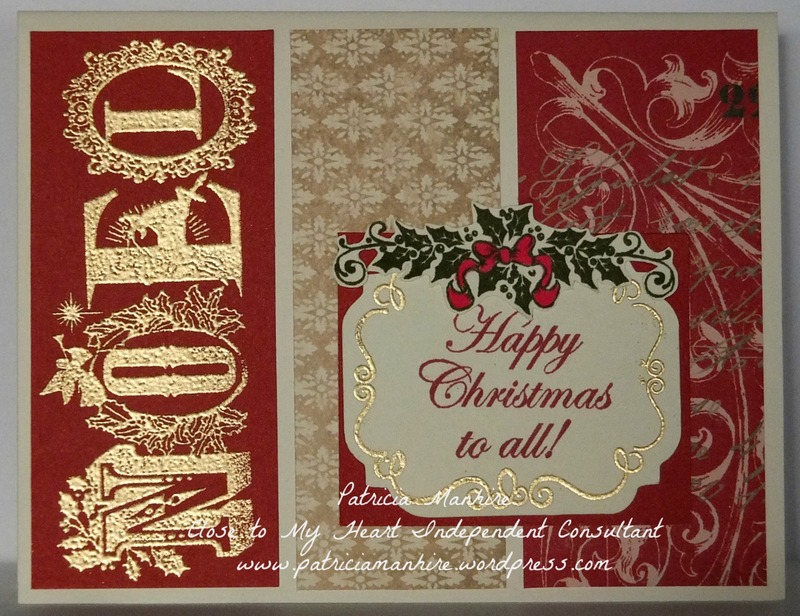 I have also used wet embossing to create the shiny effect on these cards. I have been making cards for 20 years now and the first technique I learnt was wet embossing and I was so thrilled to see CTMH bring back embossing powders and I have finally had the chance to use the powders that I have bought. For this card I have embossed the baubles from the Holiday Cheer stamp set with gold powder on Ruby cardstock and then fussy cut them out. This card is similar to one that I did earlier on and I changed it a little to make it easier to cut up for classes. The bow has been cut out of the Artiste cartridge and finished with a bling gold gem. 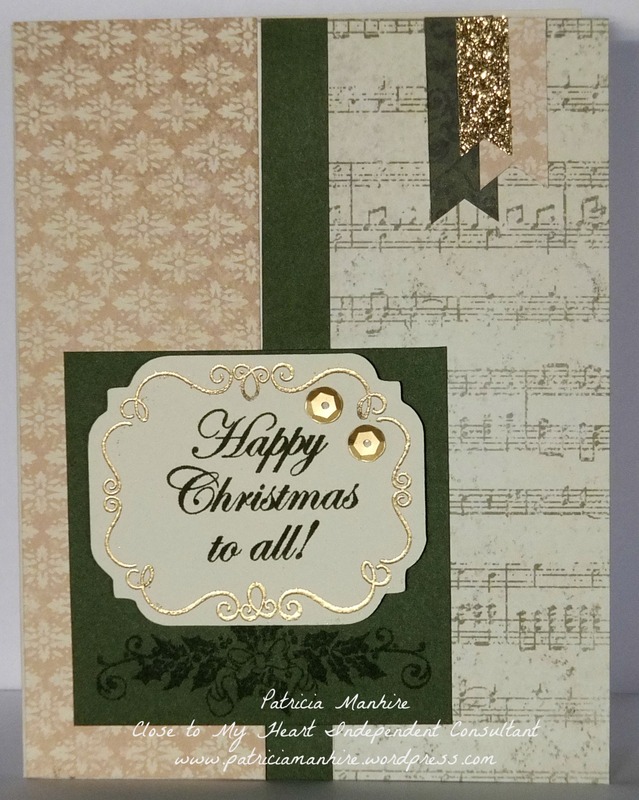 This card has been inspired from the Annual Inspirations Book and using the pattern from MIFYH book Volume 2 pattern 28. This is such a simple card design but is so versatile and here I have used two different papers and also Ruby cardstock for the panels. I have stamped the Noel from the Noel stamp set and the sentiment is also from the same stamp set. I love the Curlicue stamp set from the Artfully Sent cartridge and now have a supply ready to go. The frame has also been embossed with gold embossing powder. The holly wreath is from the Noel stamp set and I have stamped it on scrap Colonial White cardstock and fussy cut it out to place at the top and coloured in the ribbon with the Shinhan Touch Twin Carmine marker. 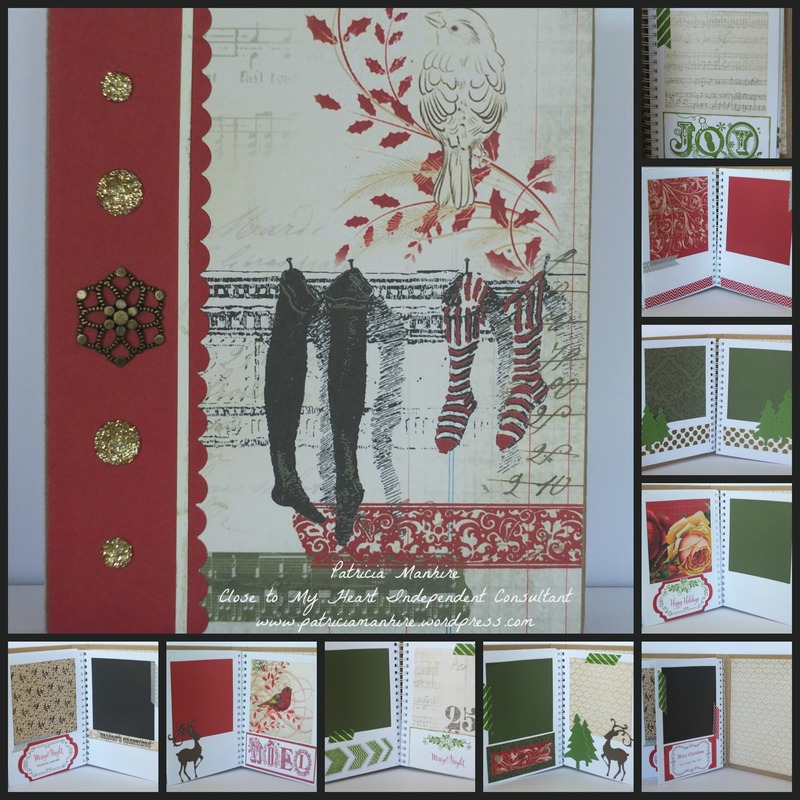 This card has also been inspired by the Annual Inspirations book and the MIFYH book Volume 2 pattern 23. Very quick and easy to do but a stunning card just topped off with gold sequins. 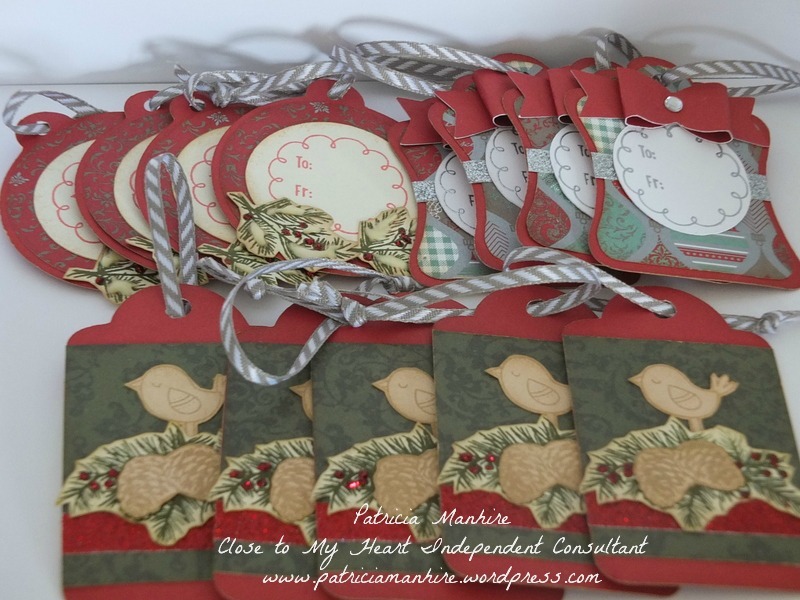 I then made some tags using different tag shapes from the Art Philosophy Cricut Cartridge and using the Yuletide Carol papers decorated them to make little packs for sale. I have used a number of different stamp sets – Seasons Tweetings, Yuletide Carol WOTG and Sweet Salutations. Finally I have decorated some Kraft bags with the Yuletide Carol papers and Cricut cuts from the Art Philosophy and Artbooking cartridges. I bought the Kraft bags from my local $2 shop and I am pleased how they have turned out. 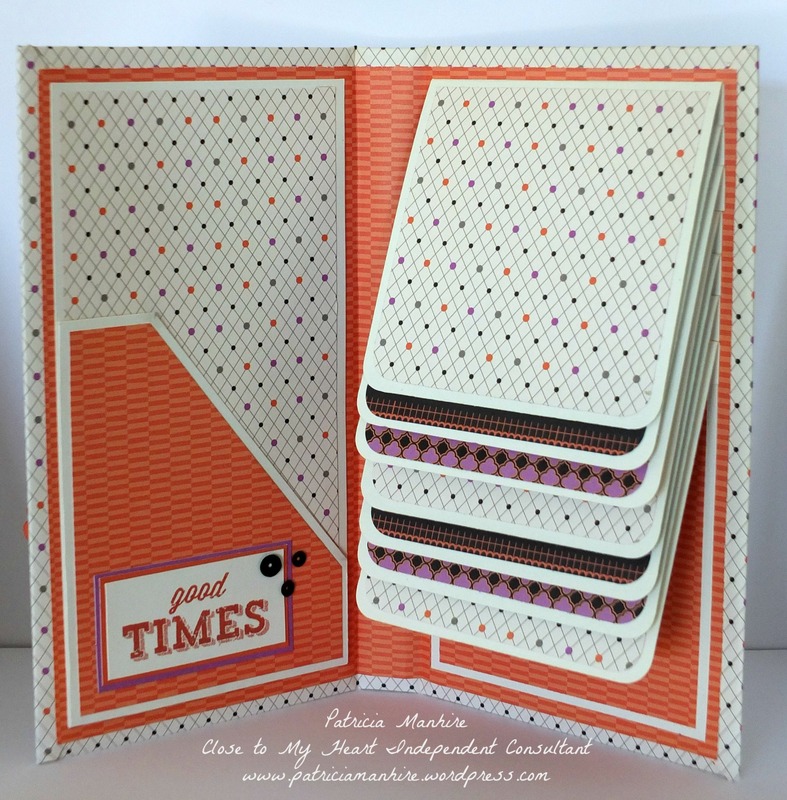 It is always good to stretch myself out of my comfort zone of cards and scrapbooking. And they did not take very long to make! For this bag I have cut the deer out of the Artbooking cartridge and put the washing tape directly onto the bag for a softer look. The bauble is from the Home for the Holidays SOTM set from October. 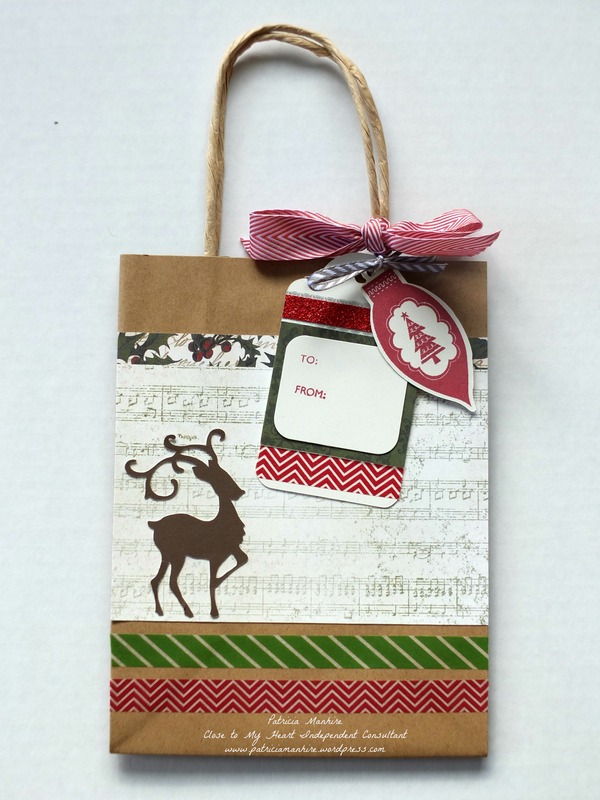 The ‘T0 and From’ for the gift tag is from the Holiday Tags stamp set . 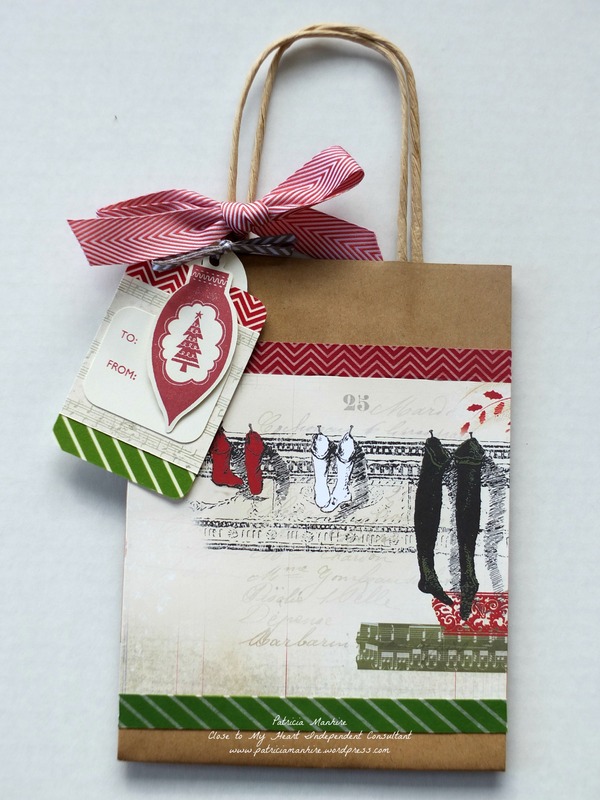 I think this stamp set is one of my favourites because it is so versatile for lots of different projects. This particular paper is my favourite paper – it is so whimsical and on the back is the most beautiful roses and it is hard to decide what side to choose. This time I have put the washi tape onto the same colour cardstock to create a stronger colour. I have used Ruby chevron ribbon (free from last months Ribbon special) and Slate chevron ribbon. Most of these products will be available for sale at Gift Hutt. I also have some kits available for sale for the cards. Please feel free to contact me through this blog – they can be pre stamped and just ready to put together if you would prefer. As usual all these products (except for the Kraft bags) are available from my website here. I have been very busy doing more Christmas cards and lots of other goodies for Gift Hutt. 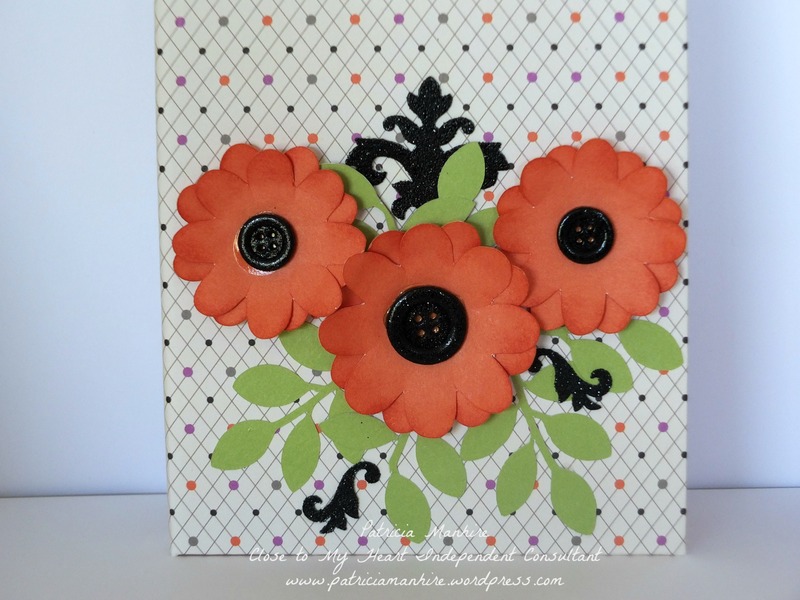 Today I would like to show you a card made using the new Artfully Sent Cricut cartridge. I have been having problems using Cricut Craftroom so had not been able to do much for a couple of weeks, but finally yesterday I was able to cut again. I am still getting used to the new cartridge and I have seen some amazing pieces of artwork on various Facebook groups I belong to. 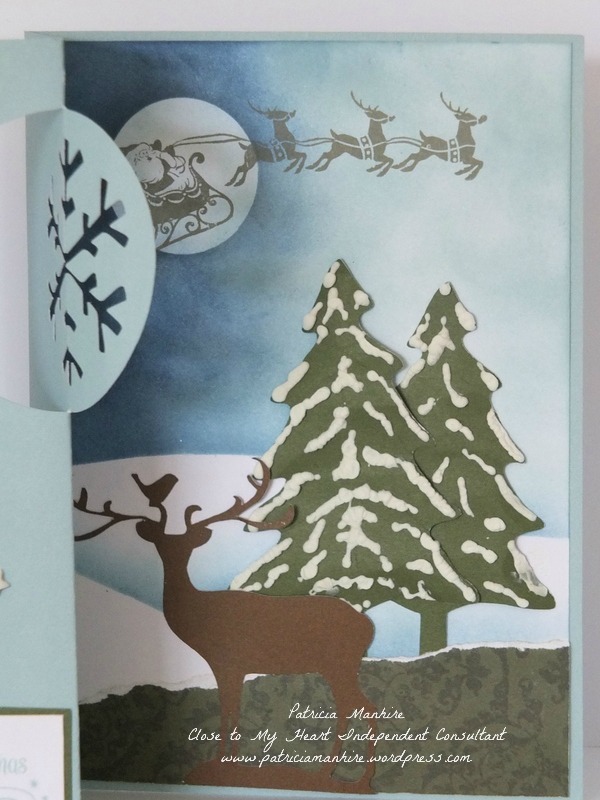 For this card I have cut out the scene card on page 47 of the booklet at 7″ out of Glacier cardstock. I then cut out a piece of White Daisy cardstock at 4 3/4″ x 6 3/4″ to use for the scene. This is the first time I have sponged a background and it is not perfect but still gives an idea of creating the scene. There are a number of different videos on YouTube if you would like instructions on how to do this. 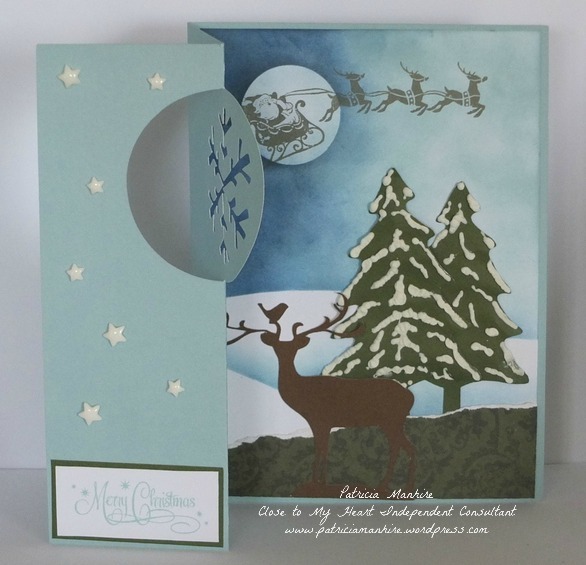 To create the snow hills I have used scrap cardstock shaped to create the hills and I have used a combination of Glacier and Indian Corn Blue inks for the snow and added some Outdoor Denim for extra depth around the moon. To make the moon I cut out a circle from a post it not at 1 1/2″ and used that to sponge the colours around to create the moon. I softened the moon by sponging lightly over with Glacier ink. I then stamped the Santa Claus from the Santa Claus Holiday stamp set with Slate ink to create the depth of the image. I stamped the sentiment from the Holiday Cheer stamp set using Glacier ink on White Daisy cardstock and matted it with New England Ivy cardstock and placed it on the front. I then placed white enamel stars for a snow effect on the front. My technique could do with some practice but I am still happy at how the card has turned out for my first effort. And the good news is that CTMH provide 5″ x 7″ envelopes to match so this card will be for sale at Gift Hutt and would make a very special card to give someone. I have some more Christmas ideas coming up and will post them over the next week. I have just had a very productive morning this morning crafting with my aunt. 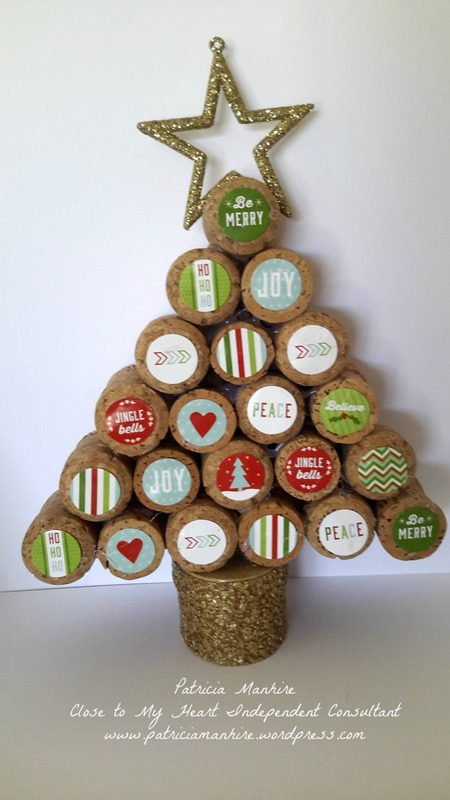 She had seen this idea on Pinterest of using corks from wine bottles and making a Christmas tree and we finally got around to making them up. We made two trees – the first one I decorated with the stickers from the Cut Above Holiday Treat Bag kit. 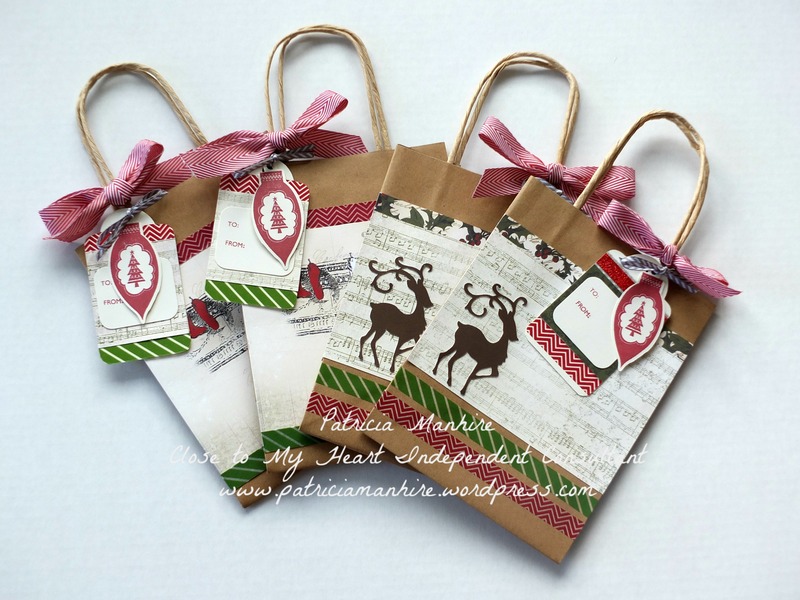 These packs are great for treat bags and they come with lots of stickers to decorate. When my aunt was working at a rest home she collected the used wine bottle corks and today we got together to make up the trees. She had bought a small oval box from the local $2 shop and filled it with sand. She then covered it with some gold coloured textured wallpaper to create the base of the tree. This came up really well and looks just like a log of wood. Then we got the hot glue gun out and glued the corks together. We first glued the six bottom corks together and then worked our way up to the single cork at the top. 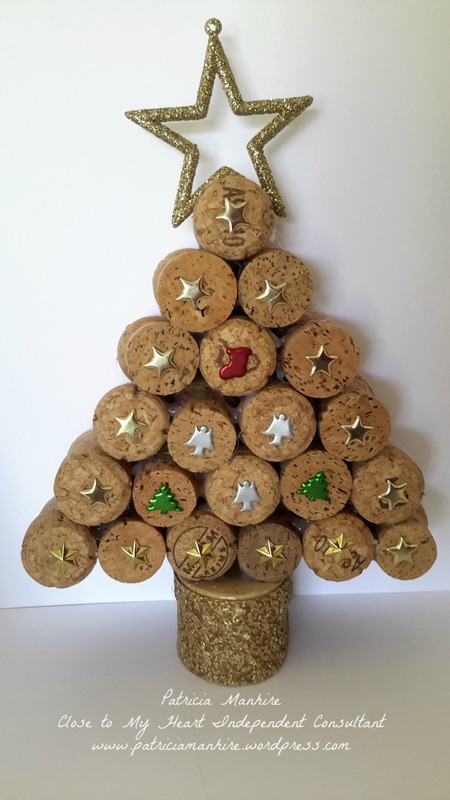 The corks were different sizes and shapes which makes for an interesting tree shape. I made the mistake of putting the stickers on first but I should have left them to after the tree was completed and then I could have coordinated them better and also they would have been straighter as well. Never mind it still came up well. My aunt had the star and we cut a groove at the top and glued the star in place. It didn’t take very long at all and we were very pleased with the result. And here is the second tree my aunt made using different brads. As you can see it is quite effective. I hope that I have inspired you to create something different and out of the box. This is a stunning technique I would like to try sometime. Lots of possibilities. Several of you asked us how it was done. So we took your questions to the artist herself, and not only was she generous enough to show us her methods, but she also created yet another stunning card for us that illustrates this beautiful technique. Check it out! Isn’t that beautiful? The technique used to create this kind of background centers on our all-purpose mat. (This tutorial will only add more truth to its name!) The non-slip surface makes it perfect for mixing ink and water to create special artistic effects. There’s an infinite amount of possible art you can create with this technique, but first try this quick tutorial on creating the background seen on this great Happy Autumn card. It is not that long to Christmas now and I have been busy with Christmassy things such as Christmas cards and decorations. However, I have taken some time out to complete this My Creations Hip Pic album. 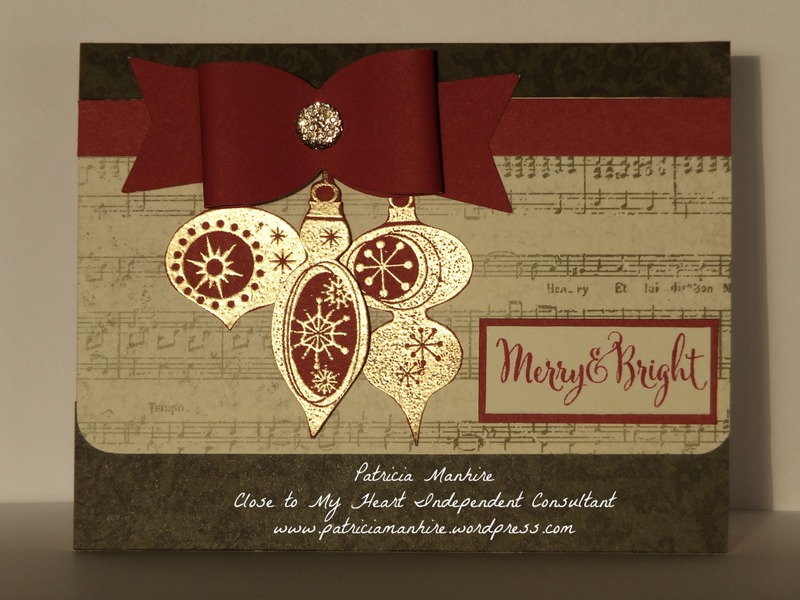 I have been looking at these albums for some time and I was inspired by my upline, Grace Green, who created a similar album using the Yuletide Carol papers. I love these papers as they are so traditional and the patterns are beautiful. Some of them are too beautiful to cover with photos in fact. 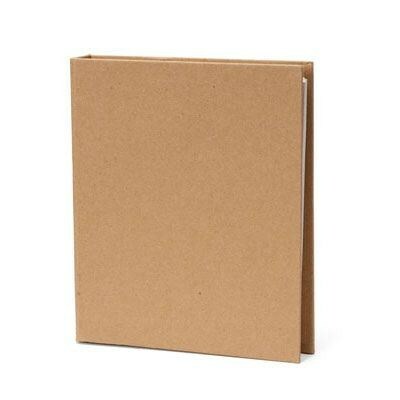 The Hip Pic albums are sturdy kraft chipboard albums with 16 white pocket photo pages with 3¾” × 3¾” windows that hold 16 – 4″ × 6″ photos and are spiral-bound. You can decorate as much or as little as you want and they will look fabulous. 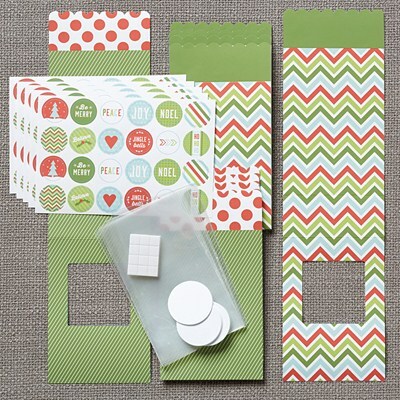 These are very inexpensive and great to decorate up with lovely papers and embellishments and give as a gift. I have done the front of the album utilising the lovely image of the stockings and the bird. Inside I have used an assortment of stamps and die cuts from the Artbooking and Artfully Sent cartridges to decorate the pages. All these materials and the album are available for purchasing through my website here. This album will be for sale at Gift Hutt. As promised here is the other waterfall folio album I have made using Scaredy Cat papers this time. I struggled with this one as I kept making mistakes and the finished product is lots of cover ups but I am really pleased how it turned out. I was really unsure of the Scaredy Cat papers as it is for Halloween which we don’t really celebrate here in New Zealand. 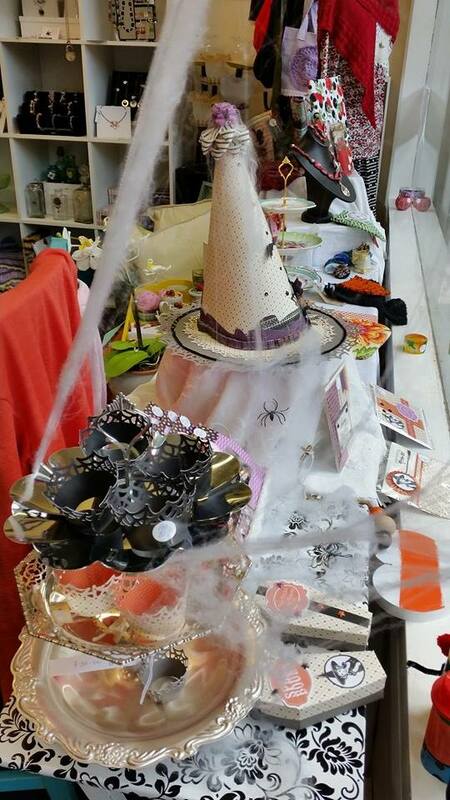 However, there is only one sheet that is Halloween focused and the rest can be used for lots of different projects. The colours are so vibrant and strong and it was good to get out of my comfort zone of pastel colours. Here is the front of the album. I have used the Artbooking cartridge to cut the sentiment and the Artiste cartridge to cut the flowers out of Sunset cardstock. The flowers have been cut and at 2″ and 1 1/2″ and I have inked the edges of the flowers with Sunset ink. 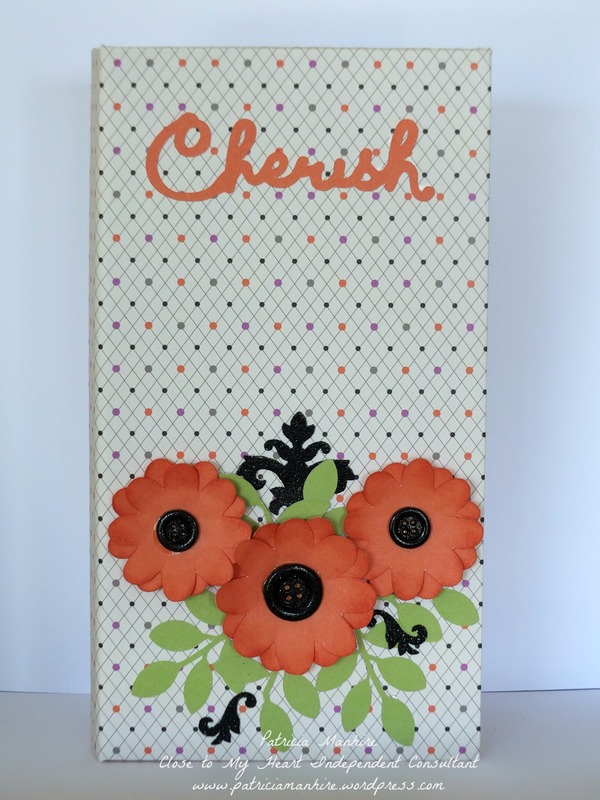 I have used the Mini-Medley Accent Black collection for the embellishments which really make this stand out. The leaves have been cut from Pear cardstock to soften the arrangement. Because the paper had a one way pattern I kept cutting it wrong but as I said before I am happy with how this has turned out. There seems to be a good balance with the patterns and paper. I was intending on using some flip flaps but unfortunately I seem to have mislaid them. The sentiment has come from the Take Note Cricut Bundle from the Artbooking cartridge. 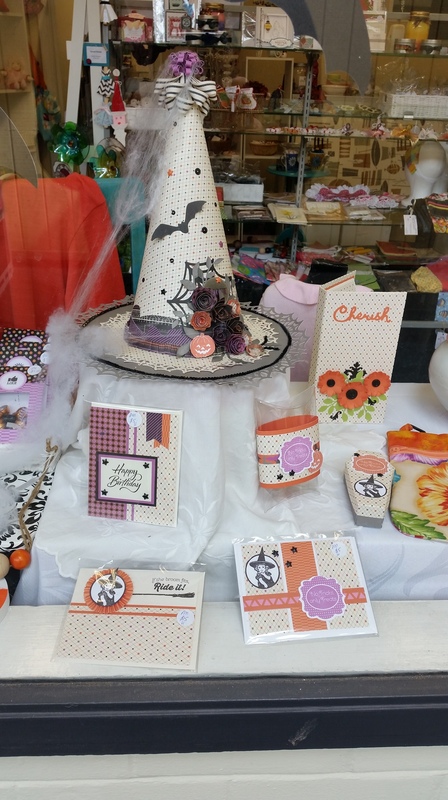 I have also made some other items with the Scaredy Cat papers (including the hat) and here they are displayed at Gift Hutt. They looked great in the window. I really enjoyed making all of these items and I hope that it inspires you to do the same. All the products used are available from my website here. 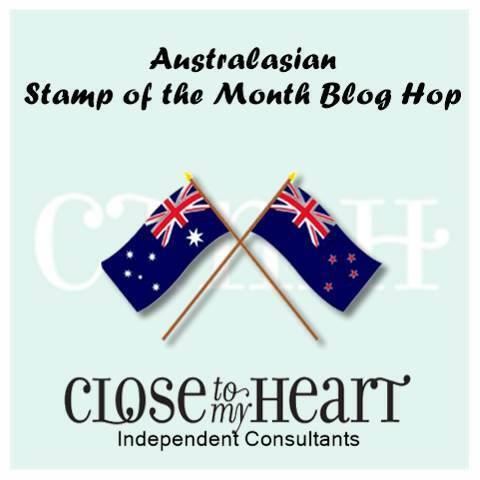 Hello and welcome aboard our Stamp of the month Australasian Close to My Heart Blog Hop. If you have arrived here from Jenny’s blog – The Creative Heart then you are in the right place. If you landed here by accident, no problem, please join in by following the link at the end of this post. Today I would like to share with you my creations which features the November Stamp of the Month ‘It’s the Little Things’ available exclusively throughout November for $33 or just $5 when you spend $75. I love this whimsical stamp set as it is so versatile for all sorts of projects and today I have done a card and a box featuring the flowers. 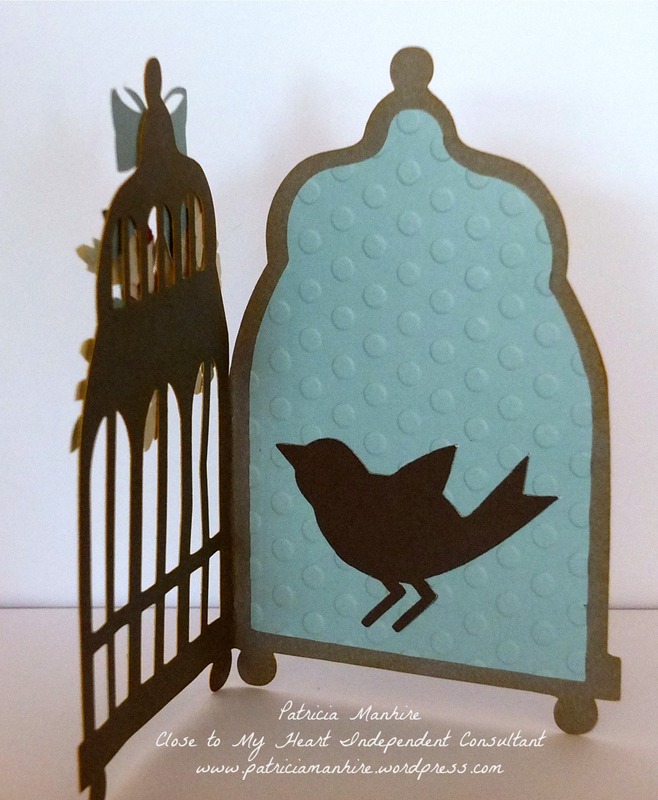 This card has been cut using the Artfully Sent cartridge in the shape of a cage and there is a matching card liner to coordinate featuring a bird so that it looks like the bird is in the cage. I have stamped the flowers and leaves and fussy cut them all out. 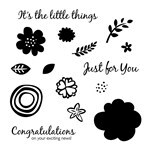 This stamp set is great for those that do not have a Cricut machine to cut shapes to fit the stamps. 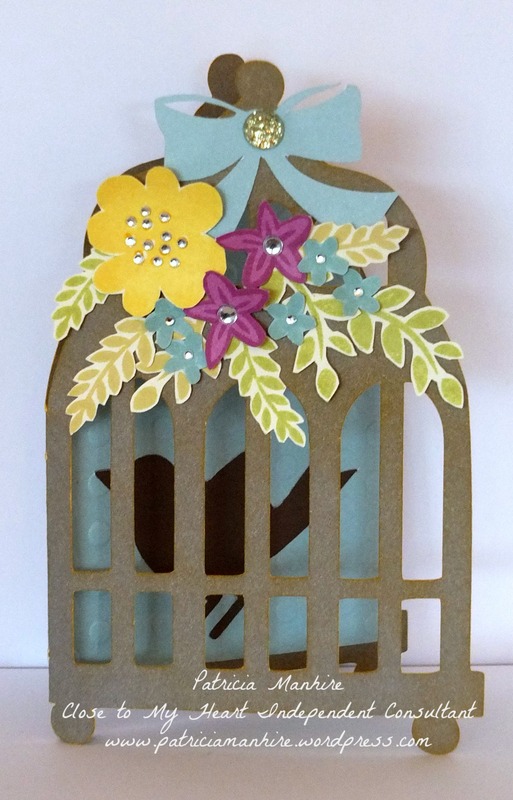 There are all sorts of flowers that are great for layering but here I have made them single flowers to create a garland of flowers draping over the bird cage with just a peep of the bird in the cage. I love tone on tone stamping and have used Thistle ink on Thistle cardstock and Glacier ink on Glacier cardstock. The second project has been inspired by the Annual Inspiration book. I am really enjoying making three dimensional objects with the Artiste cartridge and the Paper Fundamentals papers combine really well with making boxes. I have used the Sorbet coloured paper fundamentals paper and created the box out of page 44 of the Artiste booklet. 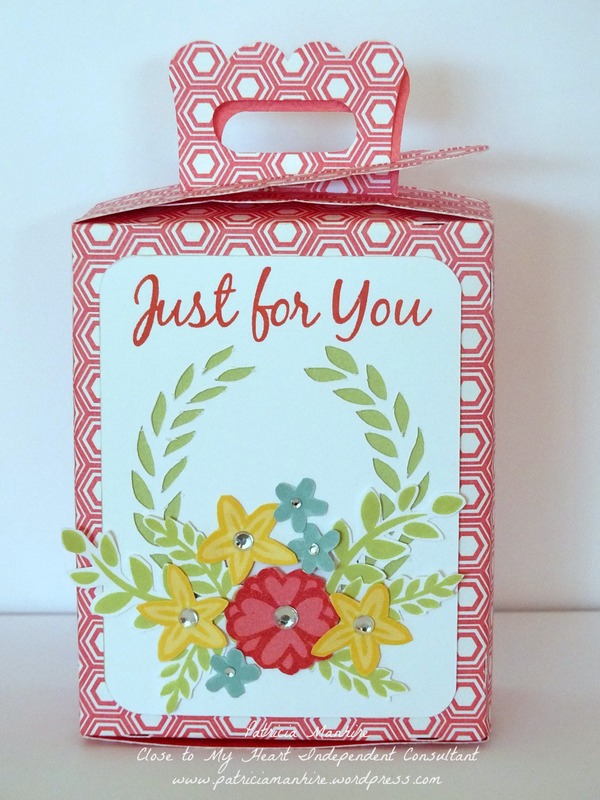 I then used the Artfully Sent cartridge and cut the pocket card from page 20 and then placed flowers and leaves on the front and finished the front with the ‘Just for You’ sentiment. It’s the Little Things is only available until 30 November from your CTMH consultant. I’d love you to leave a comment before heading off to the next stop, Denise’s Blog, Scrap Stamp Share.